eTopps, the only sports card to be sold exclusively on the Internet, released the first installment of its English Soccer Team collection today. The release, which coincides with the 2004 European Cup beginning next week, will feature 15 members of England�s national team and is the first of its kind for eTopps. "Soccer is the world�s most popular sport and eTopps is a world-wide product," said Warren Friss, VP of Interenet Business for Topps. "This offering demonstrates another great aspect of eTopps� true potential � the ability to enter new card markets for Topps." In addition to the program�s first international release, eTopps now makes it easy for users worldwide to make real-time card trades. 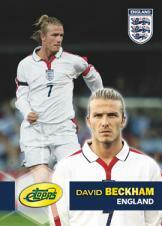 "A soccer fan in London can now trade their David Beckham to a Hideki Matsui collector in Japan," added Friss. eTopps will offer a total of 15 player cards over a three week period. This week�s offerings include Michael Owen, Frank Lampard� Paul Scholes, Ashley Cole and Kieron Dyes. David Beckham, the world�s most popular player, will be offered starting June 14.
eTopps cards, which also feature baseball, basketball, football, hockey and NASCAR stars, are available during limited offering windows and in very limited quantities (2,000 � 10,000). Once the ordering window closes, the cards are never offered again. The price for each card is between $4.00 and $9.50. Only eTopps cards held in personal online portfolios can be traded, sold or used in eTopps games. Portfolios are constantly updated to reflect the latest card prices on the eTopps Trading Floor on eBay and consumers can track cards and market trends on the eTopps Trading Floor Summary.